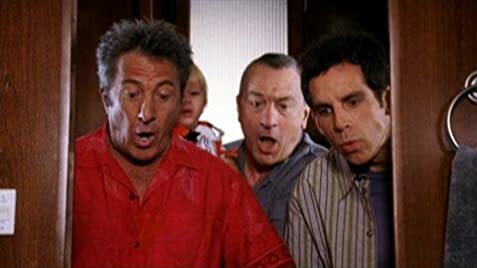 After convincing his fiancée's parents to allow them to marry, Greg Focker (Ben Stiller) now has to deal with what happens when her ex-CIA father Jack Byrnes (Robert De Niro) meets his own wacky ex-hippy parents, played by Dustin Hoffman and Barbara Streisand. Robert De Niro spent a lot of time when he wasn't filming, hanging out with the twins who play his grandson. He felt it important to bond with the twins as much as possible to make his on-screen relationship with them credible. Gunther - Immigrant Man: You must do something! Baby's coming! Greg Focker: Yes, I know baby's coming. Miss, you have to stay calm and take deep breaths, okay? Greg Focker: Myra! I need a doctor here right now! Admitting Nurse: I'm working on it! Venka - Immigrant Woman: You're not doctor? Greg Focker: No, I'm a nurse. Gunther - Immigrant Man: You're a man and you're a nurse? When everyone discovers the baby with the bottle glued to his hand, Roz hold up the bottle of glue and it is completely clean and closed. During the credits, Jack is seen watching the tapings of his secret camera, this was also done in the first movie when he watched Greg, this time he sees all of the Fockers in the camera. Also, this time, Greg realizes he's on-camera, and he has some fun at Jack's expense before revealing he's onto the surveillance. US DVD release features an extended edition which incorporates the deleted scenes (from the special features) into the theatrical cut and runs 124 minutes.